I sent this to my daughter for Christmas and she absolutely loved it. Learn what tranquility is all about and be at peace with our calming Art de’ Moi Green Tea Zen Spa Set beautifully presented in a wooden spa caddy. With its combination of pampering spa essentials and soothing green tea to de-stress with, it’s a gift of relaxation that can’t be beat. Each basket is hand crafted with attention to detail, shrink wrapped and tied with a bow for presentation, ready for gift giving. Add a personalized message with your order by selecting gift at check out. The Spa products featured in this gift are part of the luxurious Art de’ Moi Spa Line, manufactured and distributed exclusively by Art of Appreciation Gift Baskets. 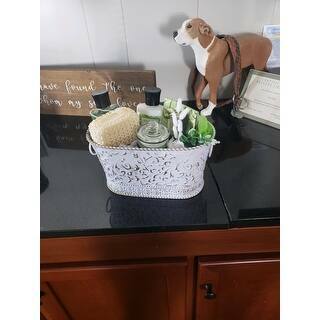 An original gift arrangement by Art of Appreciation Gift Baskets.&#153; Each gift is hand crafted and assembled in the USA, US Trademark #4371601. NOTE: Some components may be imported. I just love green tea and bath sets. This was especially fresh scented and I love the feel of the bath salts and the lotions. Everything made spa time very relaxing. The first two pictures are what I ordered. The third picture is what I recieved. There was no exfoliating scrub, no body butter, no towel, and no green tea. In place of those things was a small candle and scrubbing glove. The wooden basket was also not recieved in its place was a metal one. That part isn't very important but it's just not what I ordered. 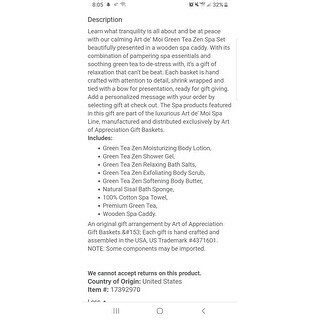 *** to pay *** and not receive what I ordered or receive half of it. I love these baskets. They are the perfect gift for any occasion, or no occasion at all! It presents well and everyone loves Bath and Body products.